In the picture above is the wonderful 2004, but this review I'll cover both the 2005 and the 2006 vintages. Both of which were in my estimation remarkably well made wines, with a QPR score that is through the roof. Now if you are new to my blog or new to wine and are not familiar with the acronym QPR, it's one you may see time to time, tossed around on wine blogs and other publications. It stands for Quality, Price, Ratio, which means to you, the average consumer of wine that a wine with a high score in this category gives you a lot of "bang for the buck". Quite often what I look for in a wine is consistency across vintages. In particular consistency in quality, not so much in flavors or aromas, but how well made the wine is overall across vintages. 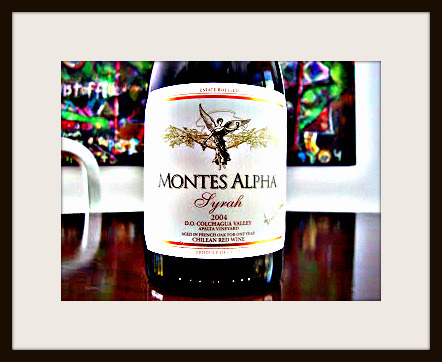 Now having only tasted through the 05 and 06 Syrah, I'm starting to think of Montes Alpha Syrah as a consistently good, well made wine, that would be worthy of a purchase 9 times out of 10. But the jury is still out on that point, but definitely under consideration. I purchased this wine while out with my old friend and his lovely wife. By the way he's an amazing freelance photographer, check out his work, which can be found at SergiosPhoto.com . If you want an event, organizational or ad-copy images to be unforgettable, give him a call! First Swirl: The color is beautiful in the class, a transparent cerise velvet curtain melding to lighter strawberry color on the rim. First Sniff: The 2005 Syrah shows a classic Syrah nose of veiled white pepper, mocha, bittersweet chocolate and black cherry, while the 2006 had also wonderful aromas of fig and espresso wafting effortlessly from the glass. First Sip: The mouth feel is wonderful and shows similar flavors and adds a toasty note and minerality, a crushed rock component on the long food friendly finish, while the 2006 delivered far more fruit forward style and feel, and less of the mineral notes observed in the 2005. Composition: This wine spent 12 months in French Barrels and contains 90% Syrah 7% Cabernet Sauvignon and 3% Viognier which gives this wine the nice mouth feel and smooths out any of the ruff tannic edges. The Alcohol Percentage is barely noticeable at 14%. Pairing Suggestions: I encountered this wine while dining at Rei Do Gado in San Diego, which is a parade of different meats flying by on skewers of which my favorites were the bacon wrapped filet's and the skirt steak. Seriously though this wine will pair with most entrees. My Recommendation: If you're foodie like myself (and I know many of you are), this is the kind of wine you could easily buy a case of or two to have as an everyday drinker. It's not the heavy handed type of Syrah you would find from down under, but an articulate food friendly velvet bomb! But before you go buying them all up, please have proper storage. This could be a very long hot summer and I would hate to see all that yummy wine go to waste! Other Voices: Wine Spectator said of the 2006 "This wine is richly layered, ambitiously styled, flavors of fig, mocha, espresso and bittersweet cocoa, backed by a lush beam of boysenberry fruit. Fleshy and toasty through the finish, with the dark fruit lingering well in the background. Drink now through 2010. 9,000 cases made.